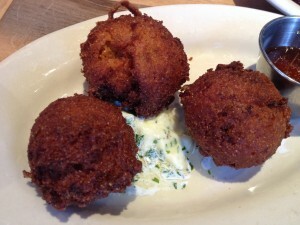 Tasso ham hushpuppies ($6) with orange-chile honey & parsley butter. The deep fried orbs were studded with ham and the honey added a nice sweet and spicy kick. My only complaint was that they were a couple shades too dark. The menu offers a “Dumpling of the Moment ($9)” and for that day it was pork and black bean. I did not realize these were fried as well. 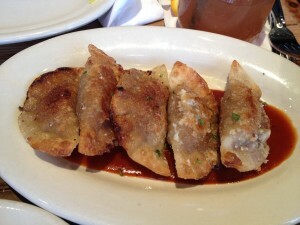 I liked them, but they were Asian potstickers, not the southern dumplings I had expected. 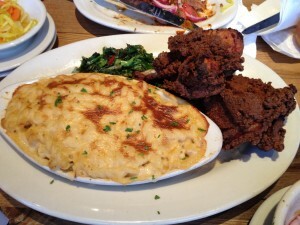 The buttermilk fried chicken ($18) comes with a generous potion of mac n’ cheese, and a tiny amount of vinegary seared greens. There is a pool of sausage gravy on the bottom of the plate making the crispy chicken soggy – I would have preferred it on the side for dunking. The pasta was massively over cooked. The chicken, like the hush puppies, had been left in the fryer too long. We got a thigh and 2 drumsticks that flirted with the line between too dark and burnt. The interior was moist and had decent flavor. 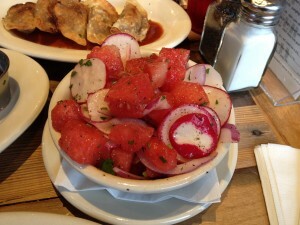 We rounded out the meal with a side of watermelon - radish salad ($3.25). It was cool, refreshing and offered a nice counterpoint to all the fried foods. The meal started with complimentary house pickles, which also helped cut the grease. Our server was friendly and attentive. None of the desserts grabbed us, so we opted for an après dinner stroll to Picco to get some ice cream.